So, before I do this unboxing, I have to admit something. The only reason that I ended up getting this box was because I accidentally deleted the selection email and forgot to skip. 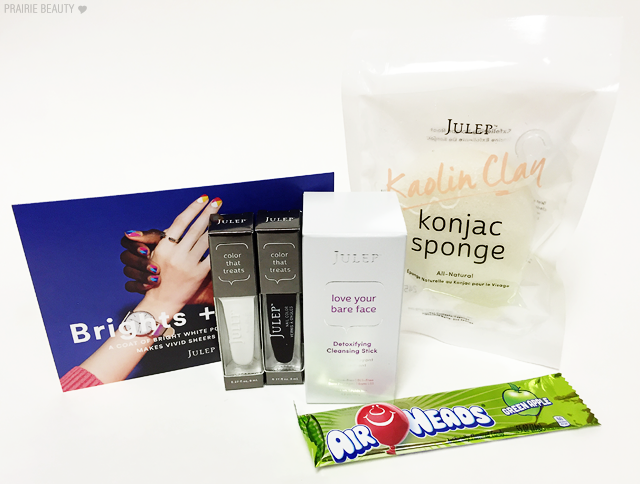 I've been pretty consistently skipping Julep for the past several months because the exchange rate is just really not making it worth it for me anymore and I think this will likely be my last box because I'm going to go in and cancel my subscription entirely. I was holding on and keeping my eyes open for products that I wanted to try, but I don't want to risk accidentally getting a box that I don't want in the future and it's just not worth it for me to stay subscribed. Anyway, I did get the box and I figured I'd unbox it here on the blog for you guys in case you're curious about the products - so keep reading to see what I got! This is your basic white créme shade that's intended to be used underneath other polishes. I'm actually pretty sure I already have this in my collection, but I never actually reach for it. As white créme polishes go, this one is pretty good. You can get it opaque and smooth in two careful coats and it does work nicely to amp up a neon or sheer polish, but I really don't use those types of polishes often because I find them really high maintenance, so I think I will be passing this along to someone who might get use out of it. In the bottle, this looks like a deep, vampy violet that almost pulls black, but because it's a sheer finish it pulls much more grape on the nails. I don't think it applies evenly enough over the white polish to actually make it work well in that way, so I would say this is probably best used to create a jelly-like look on the nails. Again, this is a little too high maintenance for me, so I probably won't really get use out of it. I'm definitely a little bummed about the polishes that I got, and it confirms that a skip would have been the right choice for me this month. So this is basically a cleansing balm in stick form. I figured it would be convenient to just kind of swipe it around my face and then rub it in to get the makeup off... But that is not how this works. It's actually really soft, so when I tried it like that I kind of broke the top and big chunks came off on my face, so I read the instructions and you're supposed to rub some onto damp hands and then smooth it onto your face. This works better. Now, I don't actually find that this does the best job of getting mascara - even non-waterproof - off and it also burns the crap out of my eyes. So, while this is a cool idea and seemed like it could be convenient, it's just not something I am going to reach for over traditional cleansing oil or balm. I actually love the Julep Bare Face Cleansing Oil, so I would recommend that above this. Now, this is the bright spot of the box for me and probably the one thing that I'll actually really use. I absolutely love the texture of a konjac sponge on my skin and I like to use it to really work cleanser into my skin, so I was more than happy to get sent this one. It's a really nice sponge. Very soft and feels squidgy and amazing on your skin while still really feeling gentle but effective. It also came with a little hook that you can stick to the wall, which is a plus for me as well since I like to hang sponges from a hook to let them dry after I've used and cleaned them. 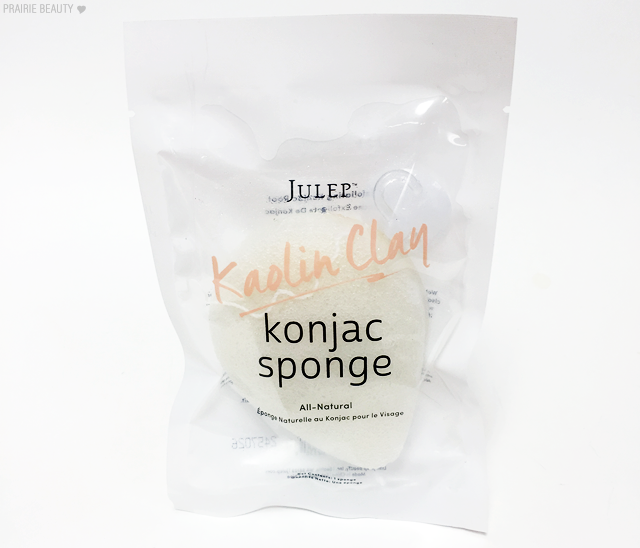 I don't think Julep has the market cornered on konjac sponges, clearly, and there are more affordable options, but they do put out a good one and I'll definitely get use out of it. So... Yeah. I was definitely not pleasantly surprised by this month's box and it has cemented my plan to leave the service all together. If you're a polish junkie, I'd say that this might be a good service for you, but as Canadians I think it's just gotten too expensive to justify and no longer worth the money. Thanks for reading! 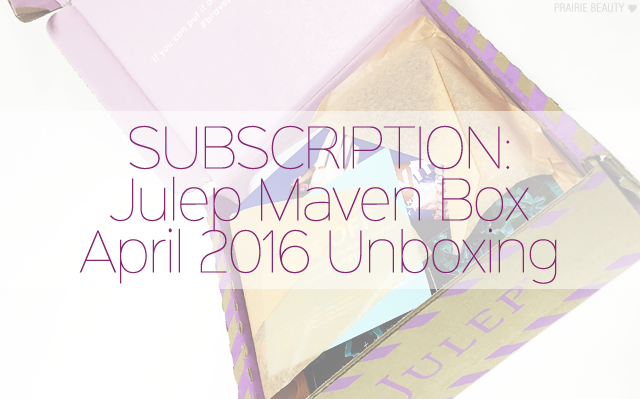 I'd love to hear your thoughts on Julep Maven in the comments below!